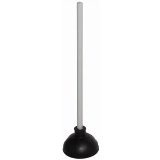 A plunger is a tool used to clear blockages in drains and pipes. It consists of a rubber suction cup with an attached stick. A plunger is a tool used to clear blockages in drains and pipes. It consists of a rubber suction cup with an attached stick.